The aim of the current cross-sectional study is to identify risk factors associated with infections caused by BoHV-1, BVDV, BLV and Brucella abortus in beef cattle herds bred under semi-intensive production system in São Luis Island - MA. Sixteen (16) cattle herds were selected and 160 serum blood samples from female animals in these herds (older than 24 months) were analyzed. An epidemiological questionnaire was answered by owners of each assessed property in order to identify risk factors associated with the studied infections; evaluations were made by means of multivariate statistical analysis. 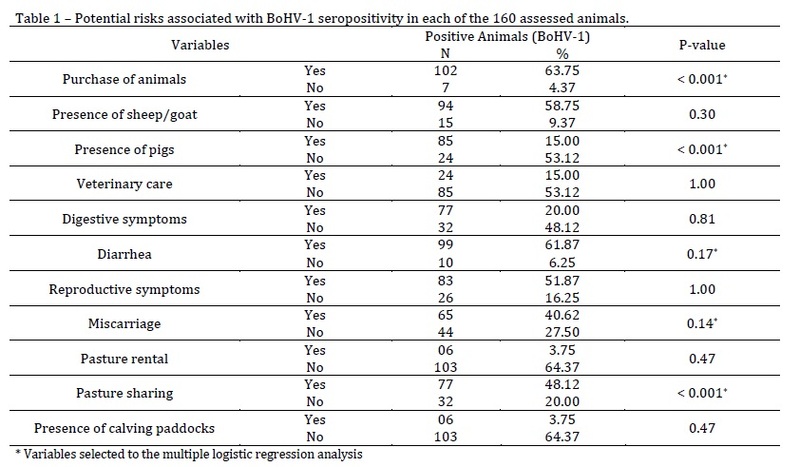 The prevalence of cattle positive to BoHV-1, BVDV, BLV and B. abortus was 68.12%, 66.87%, 62.50% and 3.12%, respectively. Variable ‘cattle purchase’ was a risk factor for infections caused by BoHV-1, BVDV and B. abortus. Pasture sharing and pig breeding in the same property were factors associated with the occurrence of BoHV-1 and B. abortus in the assessed herds. Variables ‘miscarriage’ and ‘diarrhea’ were indicative of B. abortus. Based on the current results, further attention should be given to the herein investigated region, where epidemiological investigations and control interventions should be implemented in order to avoid infections caused by BoHV-1, BVDV, BLV and B. abortus. Professora Adjunta I da Universidade Estadual do Maranhão, Centro de Ciências Agrárias, Curso de Zootecnia.